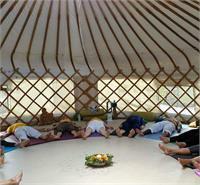 We warmly welcome you for a one day autumn yoga retreat in a traditional yurt. At the heart of the Sussex countryside, the Yoga Garden is a natural yurt studio situated in a stunning wild flower meadow on the Knepp Castle estate. The retreat offers an opportunity to reconnect with yourself in beautiful, natural surroundings. We warmly welcome you for a one day autumn yoga retreat in a traditional yurt. At the heart of the Sussex countryside, the Yoga Garden is a natural yurt studio situated in a stunning wild flower meadow on the Knepp Castle estate. The retreat offers an opportunity to reconnect with yourself in beautiful, natural surroundings. -Taxis are available at Horsham rail station, it is a 15 minutes drive to the Yoga Garden (Swallows Lane, Dial Post, Horsham, West Sussex, RH13 8NN).